Features the short-lived State of Franklin or Frankland. 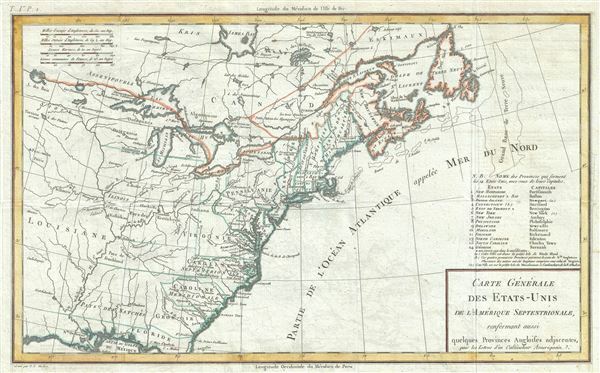 Carte Generale des Etats-Unis de l'Amerique Septentrionale, renfermant aussi quelques Provinces Angloises adjacentes. This is a fascinating 1797 map of the United States by Pierre Tardieu. The map centers on the Great Lakes covering from the Lake of the Woods (Lake des Bois) eastward to Newfoundland and the Atlantic Ocean, and from James Bay south to the Gulf of Mexico. This map's most historically significant feature is its delineation of the territories of the Jefferson Ordinance. Although unnamed, they are depicted here with dotted lines. The Ordinance of 1784 was a recommended plan for dealing with the new territory officially accorded to the United States by the 1783 Treaty of Paris, which formally ended the American Revolutionary War. The treaty ceded to the United States all former British territory east of the Mississippi and south of the Great Lakes. Jefferson proposed, rather than follow old colonial boundaries, that all territory west of Appalachian Mountains be federally administered, surveyed, and broken up into various states - for which he seems to have provided a list of rather arbitrary names. The intent of the Ordinance was to lay the groundwork for settlement and eventual statehood. Ultimately the Jefferson Ordinance was only partially adopted, but it influenced the Northwest Ordinance of 1787 and ultimately the creation of the Federal Land Survey. Perhaps the most interesting feature of the map is the appearance of 'Pays de Frankland' or the State of Franklin in the western part of North Carolina or what would today be Tennessee. Created in 1784, the State of Franklin existed as an unrecognized, autonomous state up to 1788. After North Carolina ceded the western part of its land between the Allegheny Mountains and the Mississippi River to the United States Congress in April 1784, the counties of Washington, Sullivan, Spencer (modern-day Hawkins) and Greene declared independence from North Carolina to avoid Congress from selling these lands to pay some of the War debt. In 1785, a petition for the statehood for 'Frankland' was sent to Congress and the name changes to 'Franklin' to lure support from Benjamin Franklin. Even though the petition failed to pass, the state of franklin survived as an independent nation for four years. It eventually rejoined North Carolina in 1788 when it came under attack from various Indian tribes. North Carolina would again cede this area to the federal government in 1790, this time for the formation of the Southwest Territory, which would eventually become the state of Tennessee. This important map is one of the few maps to feature both the Jefferson territories as well as the state of Frankland. Issued by Pierre Tardieu as part of Crevecouer's 1797 French edition of Letters from an American Farmer. Very good. Minor wear along original fold lines. Some offsetting.